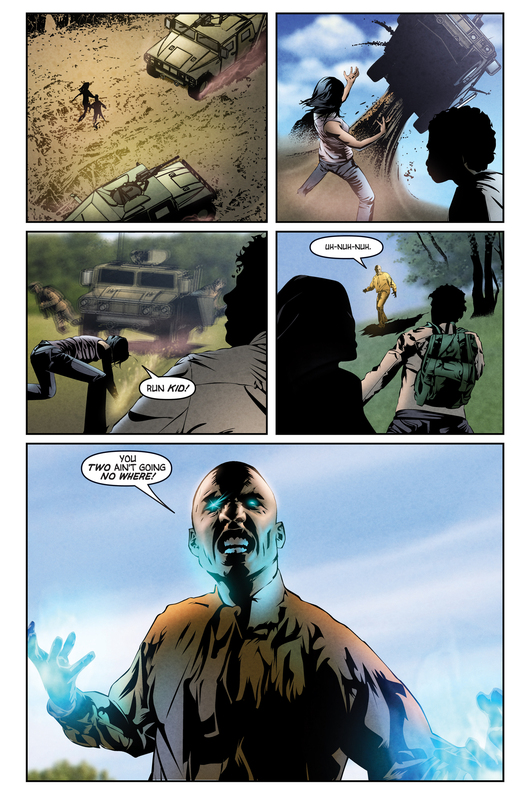 Micah returned home to discover that his entire family had been kidnapped by a secret Government organization. With the aid of his ability, he tracked down answers. Eventually locating his cousin Monica's name on the prisoner manifest of a military plane. 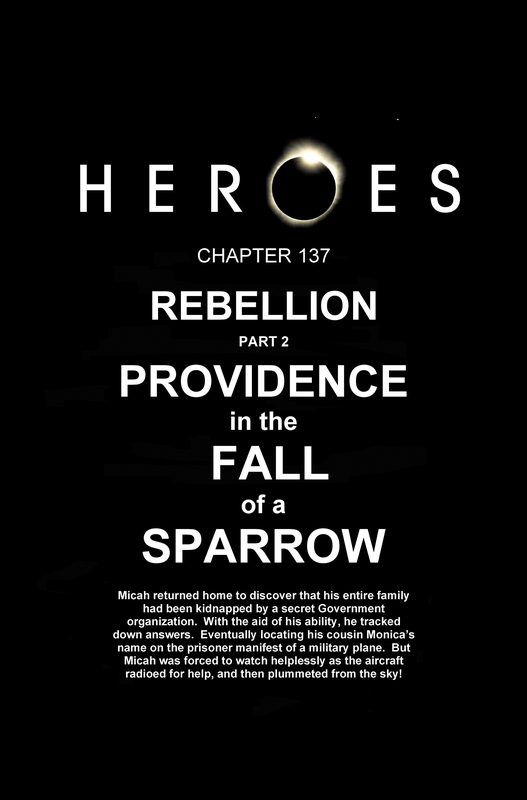 But Micah was forced to watch helplessly as the aircraft radioed for help, and then plummeted from the sky! 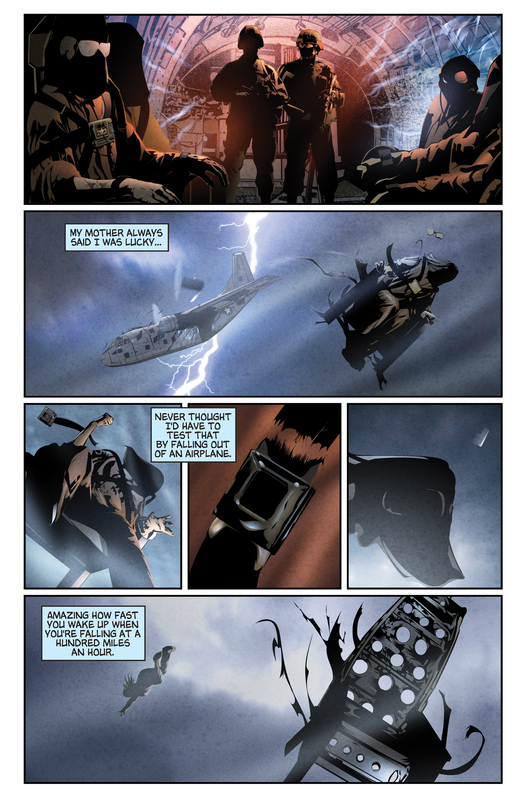 As the plane goes down, a masked fugitive is sucked out through the hole and hurtles through the air. The sheer velocity of the fall rips the seat and straps apart, revealing the fugitive to be Sparrow Redhouse. She manages to use her ability to bring the dirt below rushing up to meet her, which cushions the fall and saves her life. Later, Sparrow steals clothes from the same caravan that Matt, Hiro, Mohinder, Peter and Ando were previously hiding. 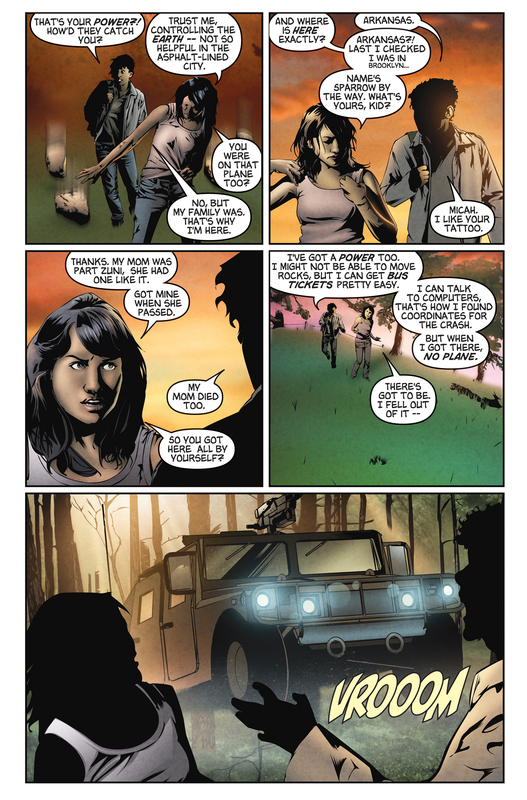 Changing in the bushes, she is approached by Micah, who has tracked the plane wreckage down using his ability and is looking for Monica, Nana and Damon. They are attacked by agents and Sparrow uses her power to fight them off. Sparrow and Micah turn to go when they are approached by Flint, who wants to help the agents in order to spare himself. However, the agents refuse to work with targets and one shoots at Flint, blowing his head off. Sparrow and Micah use Flint's death as a diversion to escape and eventually go their separate ways. Sparrow promises Micah that they'll find his family while Micah decides to unite the evolved humans to take on Homeland Security. His first step involves contacting Claire. 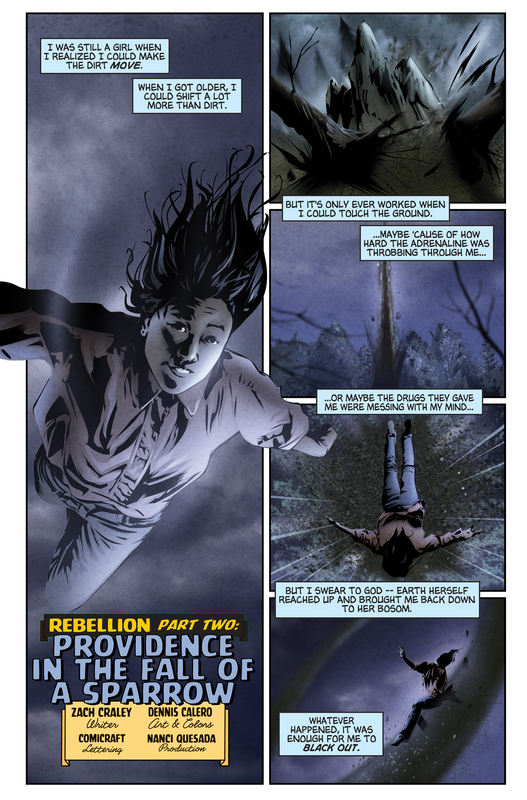 The subtitle of this graphic novel, Providence in the Fall of a Sparrow, comes from the play Hamlet, by William Shakespeare. Towards the end of the play (Act V, Scene 2), Hamlet believes that there is a guiding hand behind his own fall, and he tells Horatio, "There is special providence in the fall of a sparrow." In fact, he is echoing the Bible verse in Matthew 10:29, "Are not two sparrows sold for a farthing? And one of them shall not fall on the ground without your Father." This novel was narrated both by Sparrow Redhouse and Micah Sanders. It is possible that the hooded hero on the left in the first panel is Sparrow as they are the most detailed of the hooded heroes. After Sparrow breaks free of her restraints while falling, she seems to be wearing blue jeans, when she should be wearing the orange pants worn alongside her fellow hooded cohorts. And yet, when she arrives at the trailer that she takes clothes from, before she takes off her jumpsuit, she's wearing the orange pants (though it might've looked like that due to the lighting of the sun in the panel). When Sparrow is falling out of the plane, the goggles put on her are seen falling away from her face, yet the earmuffs aren't seen (though they probably flew away offscreen). However, after her hood is taken off, the goggles seem to still be on the hood. 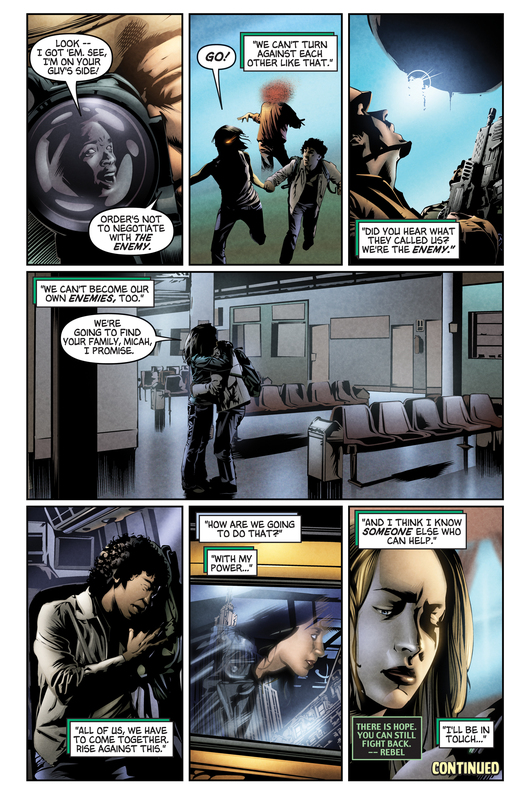 A hooded Sparrow (and the hooded prisoner across her seat) is shown to wear gloves in the comic. However, in A Clear and Present Danger, the only hooded prisoner to have ever worn gloves was Tracy. It's possible the graphic novel's artist intended for them to be hands but got the wrong memo and drew gloves instead. The novel is set during and/or in-between the episodes, A Clear and Present Danger and Trust and Blood. Oddly enough, when Sparrow's face is revealed, she has a much younger face; she looks older when she meets Micah. For images from Rebellion, Part 2, see images from Rebellion, Part 2.